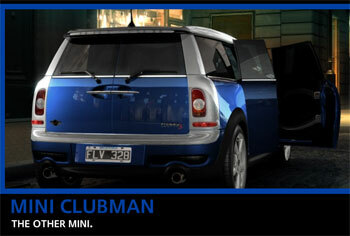 Mini has introduced a new version called a Clubman. Interestingly, this larger version of the mini has 5 doors (including 3 passenger doors and 2 barn-doors for the boot.) By extending the wheel base, there is actually supposed to be some rear seating space. This model intrigues me since it seems to defy the whole point of purchasing a Mini. I mean, really, make a choice. Do you want a big car, or do you want a Mini? In Germany and the UK there is a diesel version of the Clubman. The specs on that car are not too shabby: 42 mpg (compared to 30 list for the Clubman). Since the Cooper is listed at 31 and my personal experience in my Cooper is regularly 29 mpg, I will believe their listed specs. I would definitely consider buying a Mini One or possibly a Mini Clubman diesel for my next car, if it were sold in the US and outfitted for bio-diesel. But there is absolutely no way that I’d buy one of these Clubman cars in the colors offered for ’08 (brown and bright blue) — ick! Where’s the classy British Racing Green (like MiniLee), or how about a nice silver or black? Mini: by going both big and gaudy you are at risk of losing your core demographic – chicks like me! I took the Inner European Quiz and found out that I’m Irish. Your Inner European is Irish! You drink everyone under the table. You are currently browsing the Lura.net Blog archives for November, 2007.